On Saturday the 15th of October, the UCLG World Council met in the framework of the Fifth UCLG Congress and World Summit of Local and Regional Leaders in Bogotá, Colombia. 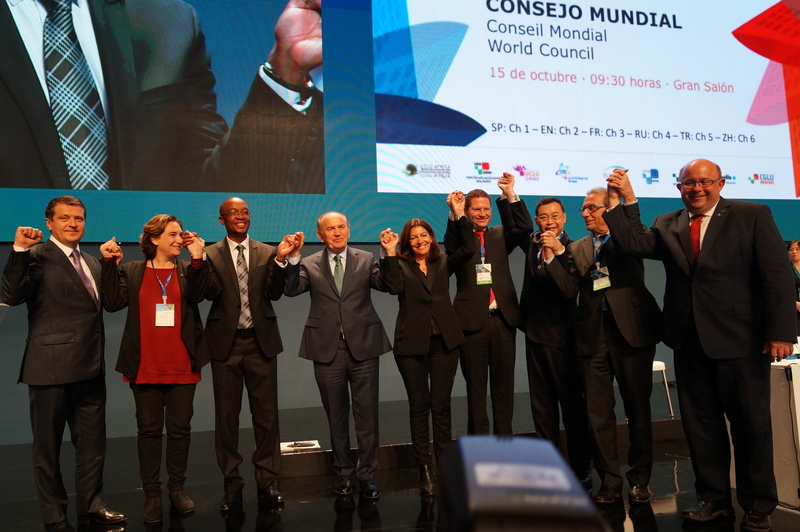 The World Council, UCLG’s principle policy-making body, approved the “Bogotá Commitment and Action Agenda” as the main political output of the Congress. The Bogotá Commitment and Action Agenda is the result of an extensive in-depth consultation process with UCLG’s members across the world, including elected leaders and local government professionals representing metropolitan governments, peripheral and intermediary cities, small towns and regional administrations. These consultations included the debates held as part of global processes such as the 2030 Agenda and Habitat III, as well as those carried out by UCLG as part of the research for the fourth report of UCLG’s Global Observatory on Local Democracy and Decentralization (GOLD IV), “Co-creating the Urban Future”. The Bogotá Commitment argues that current global challenges represent an unprecedented opportunity to drive sustainable development, and that “local and regional governments will need to be at the centre of the public policy process, translating normative ideals into concrete policies and practical investments that will remake human settlements as the primary driver of a new, sustainable era.” It also posits that “the answers generated within urban settlements and territories will pave the way for global solutions”. The Bogotá Commitment is followed by the Bogotá Action Agenda, a series of local, national and global actions that will be necessary in order to achieve the major global sustainable development agendas, including the 2030 Agenda, The Paris Agreement on Climate Change, and the New Urban Agenda adopted at Habitat III.